Sarah at Chalkboard Nails is having a contest with a theme of "dotting tool," and this is the one I'm entering. As soon as I heard "dot" I thought of the color blind tests that are made up of colorful dots, and I was so excited to create this! I started with a white backgroung and used three of each "shade" (blue, green, red, and orange) to first draw out each number in dots then fill in the rest of the nail with the opposite shade. I dunno about you, but I can only MAYBE pick out the "8" on the pinky in this pic... the others seem to have disappeared! The numbers in the picture are representative of the night of Chief's and my first date... can you see it? That is freaking awesome! I think I would have been blind after doing that. Hi, again, it's me the Anonymous-who-loves-gold-glitter-like-you -- just HAD to comment on the PURE BRILLIANT GENIUS-ness of your nails! I love it when there's a blogger who is as cerebral as s/he is creative -- SO inspiring! Um, and sadly so rare. Wow these are awesome! I might have to try recreating these one day. These are amazing! What a great creative idea! The black and white is so crazy! You really can't see the numbers at all! O.O Seriously? Are you considered color blind and do you know what type? I love this and I hope you win!! and my "anniversary" is the SAME date, how crazy is that? Awww, thank you! There are already a LOT of awesome entries to compete with, though! OMMMMMMMMGGGGGGGGGG. I can not express how much I freaking love this. When I was growing up my mom had this cosmetology textbook which had this test on the inside cover. I thought it was the coolest thing ever. I want to run through the streets in excitement!!!!! Blarg, where is the Tweet button?! ... I want to retweeeeeeet this. Okay, I'll just copy paste. I love your idea that you came up with for dots, very creative! holy amazeballs! you should totally win! this is beyond awesome! See, this is proof of why I have no hope of actually -winning- the contest, but I'm gonna have a lot of fun entering! :) As for picking the colors, you did great. If I had to guess the pinky number from the black and white, I would've said 3, so it's definitely not completely visible. GREAT JOB! I love the idea of this!!! This is definitely a win. This idea is pure genius! I love it. Mad props to you!! WOW! I love this so much. So creative :) I really hope you win! Very creative! I just purchased some dotting tools and I can't wait to use them! I love, love this so much. It reminds me of Little Miss Sunshine! 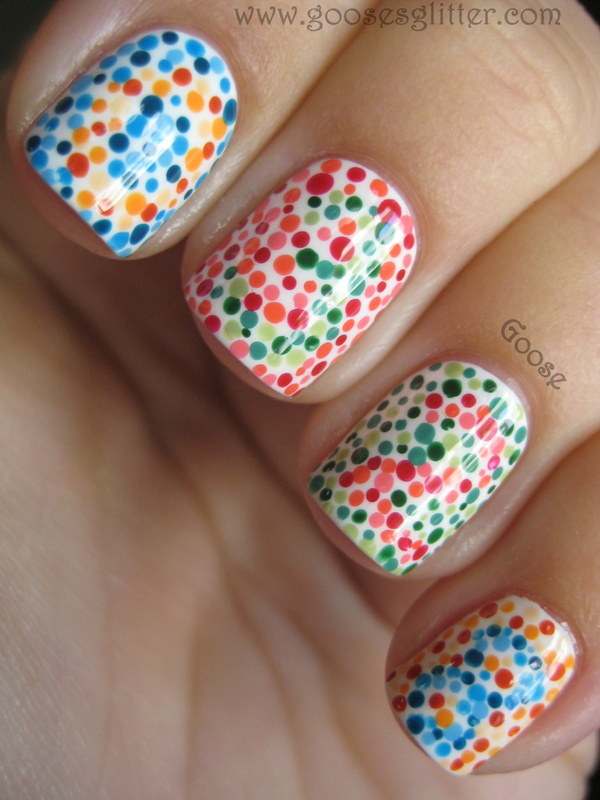 I don't think I've ever seen a more creative dot manicure! This is so freaking awesome! I love it! SUPER COOL! omg! best idea i've seen so far! This is sooooo awesome I love it!!! This was such a clever idea!!! Awesome manicure! This is brilliant!! Love it. As soon as I saw it on pinterest, I re-pinned it. Such a cool idea! LOVE the turn out <3. One of the coolest manicures I've ever seen. I'm just sad that I didn't think of it first. Truly excellent!!! This is like those color blind tests!! I love it!!! I called them out though. I really like your blog and I'm glad I found it. I was looking for swatches of the Pretty & Polished polish I just bought. Awww, thanks for the pin love! Also, thanks for watching out for me as far as the link back as well :o) That's why I put my blog url in the watermark now, so that people can find where my pics come from even if they don't have the original link. So many great entries...and I am hoping YOU win. This is just brilliant. So very creative and perfectly done. Love it. That was a great idea, very creative. But, just for the record, this is the Ishihara test and it is used to check color-blindness, a genetic desease relatateddo the X cromossome, and the colors these people cant't diferentiate are the shades of green and red, but it doesn't mean that they see all in black, white and grey. There's this very interesting website where you put your URL and can check how they would see it! Amazing idea! It looks great. this made my mouth drop! When I saw this contest I had a similar idea. Then I looked through the entries and saw yours and I didn't bother. You nailed it so perfectly! Great job. I just wanna know what you used to make those dots on your nails! This is the prettiest, most interesting mani I've ever seen <3 ! Please, please, please can you give the names of the colors? They are perfect! Thanks for the inspiration! I am excited to read more of your blog! Also, I hope it's okay that I used your photo [with proper credit and links of course!] for the blog post I did about the design I did that was inspired by you! In hindsight, I should have checked with you first. I am sorry about that! what did you do on the thumb? Conrats that you won!!! good job! Oh my gosh! I LOVE this!! I hope that one day I have the patience to re-create this. The blues and oranges together are gorgeous! Lovely work! Just found your blog - LOVE this mani! What a wonderful idea! This is one the most creative and amazing manis I have ever seen! I'm definitely trying it out! This is so awesome, and I'm not even a "nail polish person." Amazing! Please, please, please make a tutorial!! Hello!! LOVE THIS! I work for an Optometrist and we give this test to children and some adults! Basically it is to test if children can see different colors!